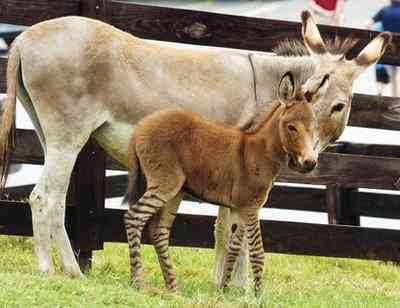 The cute little gal depicted at left is a zedonk -- the offspring of a zebra father and a donkey mother. She's four days old at present. In addition to all its other flaws, overemphasis of bipartisanship (see: Unity '08, David Broder, etc) often ends up being deeply parochial. There are a lot of creatures on our planet besides donkeys and elephants. The idea that a donkey-elephant crossbreed might bring together the best things the political world has to offer is testament to the narrow horizons of one's political world. Zedonk males are invariable sterile, and zedonk females only rarely fertile. Broderist interbreeding encourages parochialism, but is self-limiting. Oh I love the "striped leggings"! So cute, in a very 80s way.